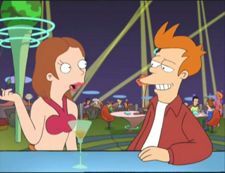 The "21st-century girl" was met by Fry at The Hip Joint in the year 3000. Fry managed to score a date with her and paid Bender to "go see a saucy puppet show" in order to get the apartment to himself (1ACV04). She attended Fry's funeral in 3003 (4ACV12), the Violet Dwarf Star Implosion ceremony in 3009 (ITWGY), and a Circus Roboticus show in 3010 (6ACV10). 21st-century girl: You're from the 20th century? That's incredible! I'm from the 21st century! This page was last edited on 5 September 2013, at 02:49.